New Signature is a full-service creative agency that provides branding, design, interactive and advertising expertise under one roof. New Signature award-winning team combines strategic thinking, distinctive design and emerging technologies to deliver successful websites that consistently break new ground. New Signature has won more than 25 interactive design awards in the last two years, with won top honors at the Webby Awards, W3 Awards, Communicator Awards, Interactive Media Awards, Web Marketing Association Web Awards and Davey Awards. New Signature also received 2010 National Capital Business Ethics Award in the micro company category (companies with 50 employees or fewer). The Awards recognize companies that exemplify a strong commitment to business excellence and to the highest standards of civic and social responsibility, integrity and ethical conduct in the Greater Washington region. Websites, rich Internet applications, mashups, e-commerce, blogs, mobile, video, and social media — New Signature's experts help our clients understand the options and harness the power of the Internet to build their presence on the Internet. Our approach is to blend robust functionality with practical usability to create an exceptional user experience. We employ the latest tactics, standards and technologies to take our clients online assets to the next level. 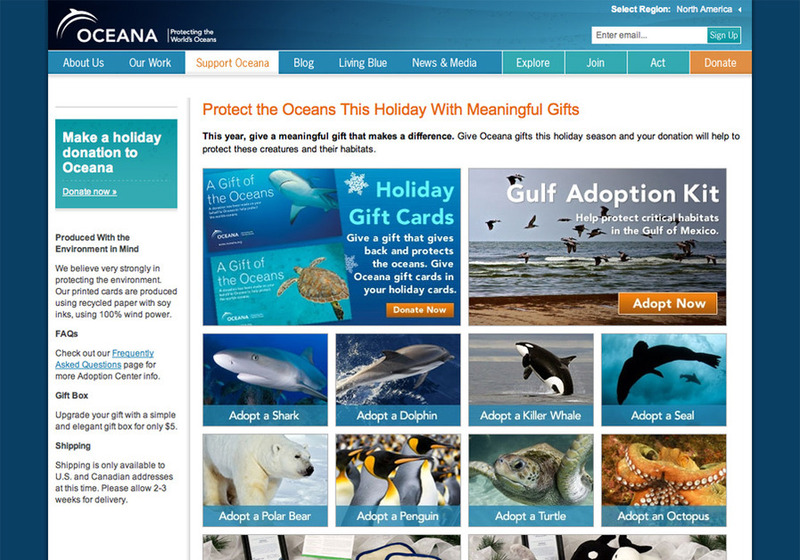 New Signature worked with Oceana to design, build and launch the updated Adopt-A-Creature section of their website. Using the website you can adopt a creature (such as a shark, dolphin, sea turtle, octopus, or penguin) for yourself or for a loved one.